I was interviewed recently by Beyond the Farm Bill, a project of the Institute for Agriculture and Trade Policy (IATP). As the name suggests, the project wisely focuses on initiatives and progress other than the traditional policy-making process in the U.S. Congress, which now has broken down so badly. What specific issues that fall outside the current Farm Bill should be considered part of food and farm policy? You are right to ask about policies outside of the Farm Bill. A whole world of food and farm policy happens outside of the Farm Bill. It is true that the Farm Bill is the largest single piece of authorizing legislation in U.S. food policy. The Farm Bill is an "omnibus bill" -- a term that for me generates an amusing image of an overburdened and rickety old city bus belching diesel and puffing with great effort up a long hill. The major titles address nutrition assistance programs, conservation programs, crop insurance, and (to a smaller extent than ever before) more traditional farm programs. Within the federal legislative arena, other authorizing vehicles also are important. If the House of Representatives has its way, even the Supplemental Nutrition Assistance Program (SNAP) may need a new home. Separately, school meals programs are authorized as part of Child Nutrition Reauthorization. The nation's most important environmental, food safety, and tax bills that influence food policy are separate from the Farm Bill. 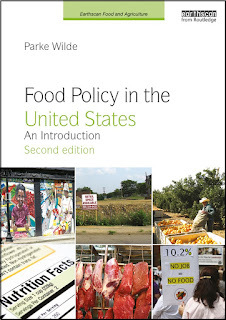 Moreover, much of food policy happens outside of federal legislation altogether. In these times of dysfunction and stagnation in federal lawmaking, many important innovations in the food system are led by the private and non-profit sectors, rather than the government sector. The local and organic food movements each do have a policy agenda, but they are fundamentally driven by consumer and producer initiative. What local/regional or other model(s) should we be scaling up? Many innovations in environmentally sound food production and distribution begin their lives on a scale that is too small to make the best use of limited resources. I enjoy seeing these initiatives grow. I have special interest in mid-scale businesses and non-profit initiatives, larger than a small farm but smaller than Cargill or Monsanto. Energy use in food production depends on miles traveled, of course, but also on other qualities such as packaging, degree of processing, and type of transportation. In bringing food to a retailer (near to the consumer), a cargo ship, train container, or tractor trailer truck can carry comparatively more food per gallon of fuel. A smaller box truck or pickup truck can carry less food per gallon of fuel. Good stewardship of environmental resources requires achieving a substantial scale of operation, and yet it may be very different from our current industrial approach. Where do you see the best opportunities for collective action in the food movement? For any food policy initiative, it is valuable to consider its degree of promise in a society that seeks to operate on democratic principles, recognizing that food producers have an important place at the table when policies are determined. Let us ask not only, "What policies do I favor?" Instead, let us also ask, "What policies can win support from a broad swath of food producers and consumers, given that we share a sense of common purpose on some principles and not on others?" In the United States, this likely means proposing measures that do address the leading environmental concerns of the day -- greenhouse gases, hypoxia in the Gulf of Mexico, water scarcity, water quality -- but without necessarily envisioning some type of revolutionary political victory over the market-oriented capital-intensive and technologically optimistic commercial agriculture that holds sway over the American heartland.